Where Does Meaning Come From? The definition of language is typically confined to human behaviors that use structured sounds, symbols and/or gestures to communicate meaning. Academic titans in the field of linguistics and cognition have done battle over whether language is behaviorally motivated by cause and effect through stimulus and response, a product of neuronal behaviors in the brain, or perhaps a hardwired human trait. Brain scientists have embarked on quests for such things as “the grandmother neuron” in the search for the means by which we get our state of awareness. Some daring warriors of exploration have pondered that language may be part of the broader animal kingdom. Some definitions expand the language bracket to include non-verbal elements of relationship such as visual communications like architectural design and art. Posture, tone and inflection are woven into the fabric of some theories or even such distant things as the signaling processes that goes on within and between biological cells and organisms. With all of this squishy chatter about the definition of language we could easily miss the common thread that ties them all together; meaning. While there are many conflicts over the nature of language, the idea that language is a structured communication of meaning is not typically in dispute. 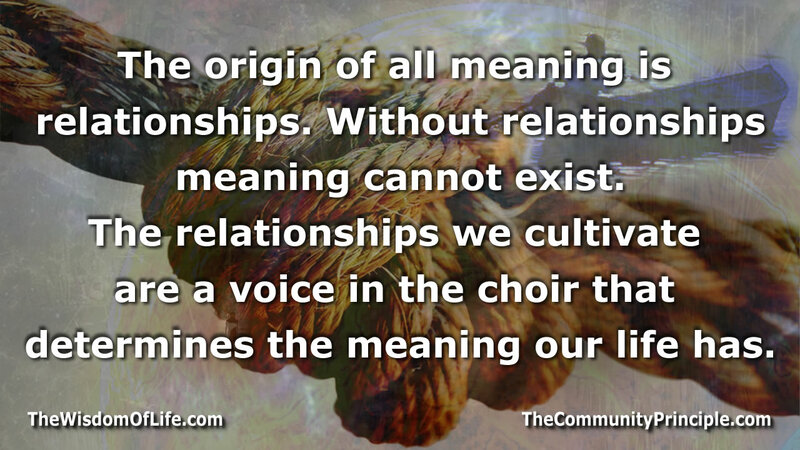 Language communicates meaning, and the origin of meaning is relationship. In fact; if we use the idea that “relationship is the origin of meaning” as our lens, it opens up a whole new world beyond the narrow definitions that confine meaning to traditional ideas of language. To illustrate the connection between relationship and meaning we can start by looking at a familiar word; “water”. “Water” is a group of symbols that stands in for the actual substance water. Although the word water and the actual substance are separate entities, these symbols and the substance are connected in relationship. It is this relationship connection by which meaning is conveyed. When a relationship connection is a shared value between two or more entities, this is the root of communication. When two or more people understand this relationship with a shared value between the symbol and the substance, communication is possible, but the point that meaning is conveyed through relationship is the key. The English word communication comes from a Latin word “communis”, which means “to share”. With meanings built on relationships as the currency of every language and shared values as the means of communicating that meaning we cannot assume that every meaning conveyed through relationships is understood. Communication requires this shared system relationship values in order to both encode and decode the same meaning. Language is the method by which meanings are encoded but communication requires encoding and accurately decoding by way of shared values. If shared values do not exist between both sender and receiver, communication can be distorted or destroyed even though the currency of meaning based on relationships still exists. With these definitions of language and communication we can explore the meaning expressed through relationships that lay beyond symbolic languages. We are no longer bound to the limits of abstract symbols as the sole means by which meaning is conveyed. We can also see how a narrow definition of language can limit our vision of meaning by cutting off communication from all the relationships that exist outside our traditional ideas of language. With a limiting lens we could also be conjuring up unreal ghosts by distorting meaning through a lens that distorts or obscures the intended meaning – in other words; losing the real meaning in translation. With the idea that meaning comes from relationships and communication from shared values, we can know that because substance water is built on relationships that it also conveys meaning. We can know that if relationships are the origin of meaning, and we deny this, that we would not understand the message conveyed through water because our lens is not properly tuned to decode the meaning. To the contrary, our abstract lens could by definition be tuned to block the real nature of the communication of water. With relationship as the origin of meaning we can look at the whole of reality as an expression of meaning instead of as a mere process devoid of meaning except perhaps within the domain of what we call human consciousness or biology. We can then use this lens to explore the meaning expressed through the relationship matrix of reality to better understand ourselves and what fulfills us. Consider the following facts: Since we are real, everything we are is, by definition, a product of reality. Because we are alive and aware, reality is alive and aware, at least to the extent that we are. Because we plan, act with intention and arguably some measure of choice, these are also factors that govern at least a portion of relationships in reality. Since we generate and perceive meaning, this is a property in reality as well. Because we use language and shared values as the means by which we express meaning and communicate; language and communication are also products of reality. The real question is not whether meaning exists, but to what extent meaning exists and is communicated. Is the communication and perception of meaning confined to our own particular biological form of existence, or is it part of the fundamental properties of relationship that define reality itself. If we embrace the possibility that meaning is a fundamental part of reality we must also embrace the notion that reality is making a statement that we may be unaware of because we artificially limited the notion of language to the sole domain of an infinitesimal fragment of specific human biology-in an unremarkable corner of the cosmos. This narrow idea is perhaps comparable to the once held view that earth was the center of the universe. We have since discovered with the aid of telescopes that the earth centric, human centric perspective was built on arbitrary and narrow assumptions that limited our understanding. It is to our benefit that this self-limiting idea did not weather the storm of empirical discovery as our lenses improved. With the aid of better telescopes, the microscope and other tools we have discovered that earth is not even the center of the solar system much less the universe and humans are a non-essential part of a much greater web of relationships that includes many forms of biology, the planet, fundamental forces, space-time and so on. As creatures that are dependent on specific relationships for biological coherence we are inseparably dependent on a much larger system of relationships. This relationship matrix is a statement of meaning. It says something about us and what fulfills us. If the relationships that define our existence are stressed beyond their capacity to render the sustained environment of nourishment on which our existence depends, we cannot exist in our current form. This means something. The lion’s relationship to the zebra and the heart’s relationship to the kidney are also statements of meaning. The fact that plants inhale carbon dioxide and exhale oxygen while we inhale oxygen and exhale carbon dioxide means something. A whole new world of meaning opens up when we expand our vision to include ourselves as part of nature, rather than mere observers of it, and that means everything. For a perspective on this narrow definition of language (not being used here), look up the terms; “biolinguistics”, “Noam Chompsky”, and “Minimalist program”. This search for the grandmother has been largely disproved over the years and the brain is currently thought to be built on a vast network structure of connections rather than specific neurons that contain single memories. For examples of communication between cells look up the term “cell signaling” and “quorum sensing”. For more information on the structure of verbal/symbolic language in general look up the terms “linguistics” and “semiotics”. A scientific paper titled “A model balancing cooperation and competition” explores the possible reasons why right-handed people dominate the overall human population. They found a correlation between competition and cooperation in biological relationships and the handedness of the population. Based on this they formed a mathematical model to see if they could predict the percentage of right and left handedness in sub groups or in other species. Human populations that disproportionately lean toward cooperation lean toward right handedness. Conversely, specific sub cultures such as athletes have a higher percentage of left-handed people than the overall population. The mathematical model the researchers formed accurately predicts the percentage of left-handers in a species or group based on the balance of cooperation and competition in the social relationships of group members. The human population is approximately 90% right handed and 10% left handed. While competitive behaviors are necessary and valuable to be able to meet the challenges we face as a species, cooperation between us is essential for the type of world we now live in. It is also essential as part of the relationship model that makes up our internal biology. Organs must cooperate with each other and our immune system must compete for dominance over would be attackers of the system. In fact, 90% of DNA in the human body is non-human and mostly built on a cooperative relationship model. Our biology is dependent predominately on cooperative rather than competitive relationships. These cooperative relationships are sometimes called endosymbiotic (internal) and exosymbiotic (on the surface). 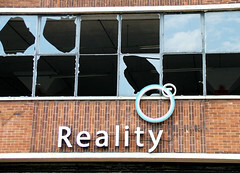 The fact that nothing unreal exists lays at the foundation of a realistic view of reality. Although we can dream up castles of verbal abstraction that aggressively step beyond the bounds of reality, every expression we actually translate into a real event is inseparably bound to the possibilities and limitations afforded to us by reality – plus and minus nothing. The fact that boundaries exist at all tells us the only way we can navigate effectively is to understand the possibilities and limitations of reality with clear vision. It can be a tricky business to recognize, much less utilize all the possibilities in the engine by which we move through this cosmic stew. Multiple layers of influence interplay to produce a delicate symphony of behaviors that constitute a system. Systems are the linguistic expression of reality. When wishful thinking, false assumptions or ignorance govern our perspective, it comes with a side dish of ineffective navigation – a prison without walls that traps us in an unsatisfactory state of poverty. To explore reality on reality’s terms, we must leverage clear vision to develop a better understanding of ourselves and to use this understanding as the map with which we can navigate to a more satisfied state of being. If we look at the spectrum of philosophies that craft the current assortment of lenses humanity navigates reality with we see that they range from partially open to virtually shut. Some of us see a deep and narrow perspective. Others see a wide and shallow one. In order to craft a lens that renders a true picture we must use extreme caution not to be too liberal or sparing, neither can we allow obstructions to transform clarity to chaos. The lens that is best suited to the task of seeing reality in its true form is reality itself. Because of this we must unflinchingly question the foundations of every assumption we hold without respect to tradition, authority or personal experience in order to have our best shot at a clear image. As biological creatures we are inseparably dependent on a delicate balance of very specific relationships both within our numerous biological systems and between those systems and the external environment. Both our internal and external relationships must be tuned to nourish the various biological processes toward a narrow range of conditions in order to be satisfied. Imbalance in the relationships we depend on to be fully nourished can damage or destroy the system. A wide variety of internal elements such as light, space-time, atoms and molecules, cells, and organs as well as external elements are involved in the process. We ride on the wave of a complex community of specific cooperative interdependent relationships. How well or poorly we cultivate this communal environment on which our biology depends defines what we experience as life. One of the clarion calls speaking through the fabric of biology is that of community. Each of the various elements of relationship we depend on in our overall biological system requires a particular set of relationships with the local environment in which it resides – a community. A brain cell cannot continue to function as a brain cell if it is outside the communal womb of other brain cells. This same context of relational dependence on community exists at all levels of biology. For instance, as human beings we depend on specific kinds of social contact in order to realize our most nourished and satisfied state of being. It is only when we are connected to the whole context of nourishing cooperative relationships that we are then able to effectively navigate to our most satisfied state of being. When we explore the fantastic spectacle of relational communication pouring out of reality we soon see that the primary means of expression is through systems. Galaxies and stars all the way to atoms and sub atomic particles are elements of relational systems. 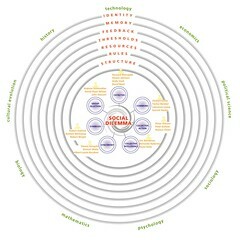 Biology, ecosystems and social relationships of all kinds are also examples of systems. Whether these systems maintain integrity or disintegrate depends on the tapestry of relationships within them. The same way our individual cells must operate in the context of their place in order to contribute to the community as a whole, each of us must find our place in the community of the larger body of life. This is the cornerstone to finding ourselves, and our fullest measure of fulfillment.